The volleyball season ended for the Highlands Ladybirds volleyball team (19-17 overall) with a 3-0 (25-14, 25-20, 25-8) loss to the Cooper Lady Jaguars in the 9th Region quarterfinals on Tuesday at Dixie Heights. PHOTO: Allen Ramsey, DWCPhoto.com. Highlands Director of Athletics Matt Haskamp stands with 9th Region All-Tournament members, from left, Kylie Stava, Claudia Hils and Olivia McQueary. The road to state has gone through these two for a long time. So it did not turn into much of a surprise that the Highlands Ladybirds and Notre Dame Pandas met for yet another 9th Region championship. The Ladybirds had the right setting in playing host to the region tournament at Tower Park. PHOTO: Allen Ramsey, DWCPhoto.com. Highlands senior Emma Little accepts the 36th District All-Tournament team plaque from Highlands Director of Athletics Matt Haskamp. Of all the losses in the volleyball series against their rivals on The Hill since 2005, this one might be the toughest. 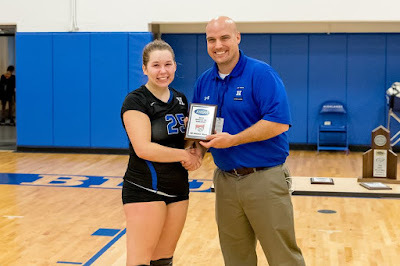 The Highlands Ladybirds (19-16) took the first two games of the 36th District championship against the Newport Central Catholic Thoroughbreds by 26-24 and 25-1 scores. But the Thoroughbreds (21-14) rallied to take the next three games and win the match, 3-2 by scores of 25-17, 25-18 and 15-11. PHOTO: Allen Ramsey, DWCPhoto.com. Highlands sophomore Alex Ford (4) makes a move in the 9th Region quarterfinals Tuesday. The Bluebirds beat the Beechwood Tigers, 4-0 move on in the tournament. The hosts took shots from what seemed to be every angle using their quickness advantage. 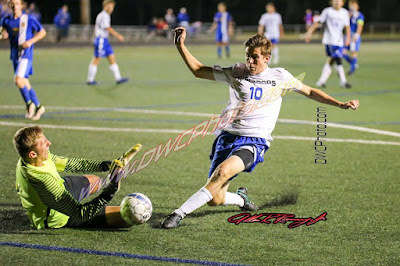 But the Highlands Bluebirds soccer team (18-2-2 overall) just could not consistently put the ball past Beechwood Tiger junior goalkeeper Cameron O'Connell. O'Connell dove everywhere making 15 saves for a young Tiger program (9-11-3) making its first-ever appearance in the 9th Region quarterfinals. 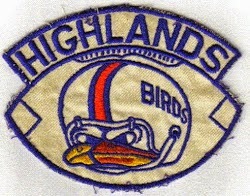 Even when Highlands put shots past O'Connell, they often flew high or wide. Luckily for the Bluebirds, they scored more than enough goals to advance to the 9th Region quarterfinals in a 4-0 victory at Tower Park on Tuesday. That marked the first region tournament victory for Highlands since the Bluebirds won the region in 2013. PHOTO: Allen Ramsey, DWCPhoto.com. 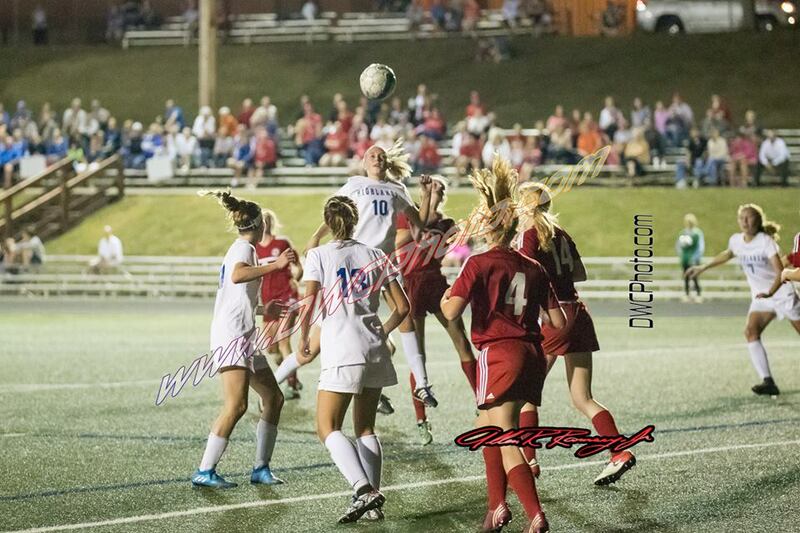 Highlands sophomore Lindsey Meyer (10) tries for a header in the 9th Region quarterfinal game against St. Henry at Tower Park on Monday. 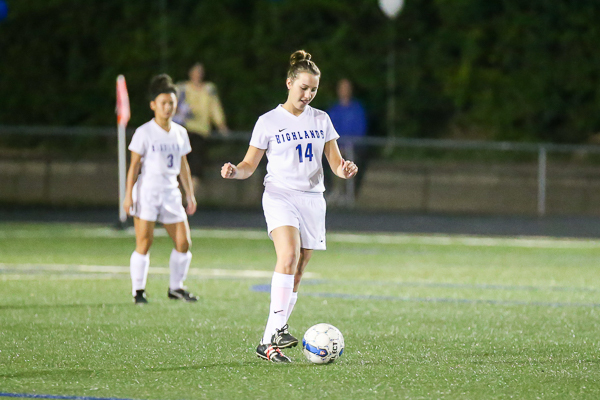 Highlands won 1-0 to advance to the region semifinals for the fourth straight year. Head Coach Brian Weifering had legitimate concerns about this game. The 36th District champion Highlands Ladybirds soccer team (19-2-1 overall) played host to the 34th District runner-up St. Henry Lady Crusaders (8-11-2) in the 9th Region quarterfinals at Tower Park after beating the visitors twice during the regular season. Highlands took down St. Henry, 3-0 on Aug. 25 and Sept. 26 both at Tower Park. PHOTO: Allen Ramsey, DWCPhoto.com. Highlands senior Solomon Farris (10) goes after the ball in the 36th District championship game against Newport Central Catholic on Tuesday. 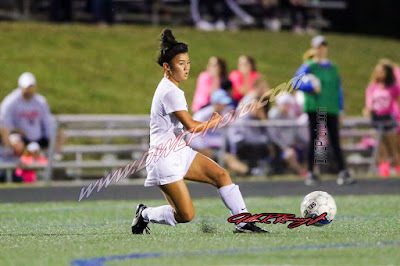 Farris leads Highlands with 34 points on the season with 15 goals and four assists. 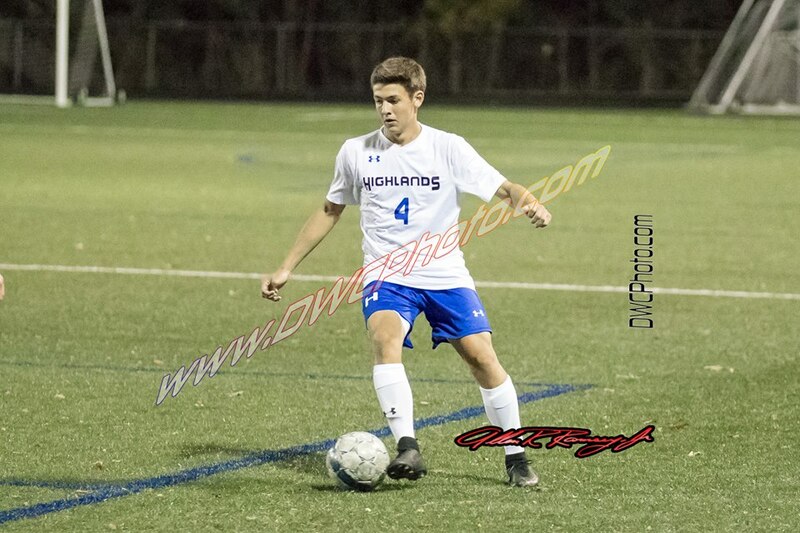 Highlands takes on Beechwood on Tuesday at 7 p.m. in the 9th Region quarterfinals at Tower Park. PHOTO: Allen Ramsey, DWCPhoto.com. Highlands senior Karolyn Lukjan pursues the ball in the 36th District championship game Wednesday against Newport Central Catholic. Lukjan has been a huge key in the defensive backfield this season as Highlands enters the 9th Region Tournament starting Monday against St. Henry. The host teams have no doubt enjoyed the successes under the bright lights of Tower Park this season. The Highlands Ladybirds and Bluebirds soccer teams have put together outstanding seasons with 18-2-1 and 17-2-2 records respectively. That win total for the Bluebirds equals that of the 2013 9th Region championship and elite eight squad that finished 17-8-1 three years ago and the 2008 state runner-up squad that finished 17-4-4. The win total for the Ladybirds equals the win total of the 2008 state runner-up team that finished 18-4-4. 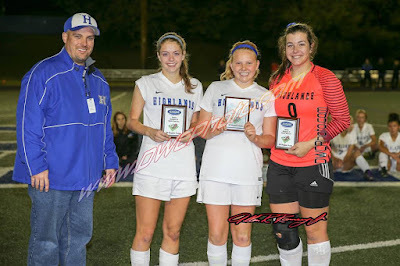 The Bluebirds followed up that wonderful regular season run with a 1-0 victory over Newport Central Catholic in the 36th District championship game Tuesday and the Ladybirds did the same with a 3-0 win over NewCath a day later allowing both teams to play host to 9th Region quarterfinal games. That marked the second district championship in three years for the Bluebirds and the ninth in 11 seasons for the Ladybirds. PHOTO: Allen Ramsey, DWCPhoto.com. The Highlands volleyball team celebrated its Senior Night with a 3-0 victory over Bellevue on Monday. Members of the team and their families, from left, are Hannah Harris, Isabelle Ison, Lauren Epperson, Emma Little, Emma Delagrange and Katy Ball. 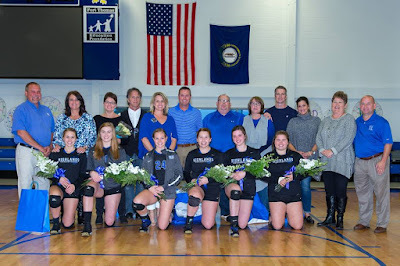 Senior Night went well for the Highlands Ladybirds volleyball team (18-14 overall, 3-1 36th District) with a 3-0 (25-10, 25-15, 25-10) victory over the Bellevue Lady Tigers on Monday. PHOTO: Allen Ramsey, DWCPhoto.com. 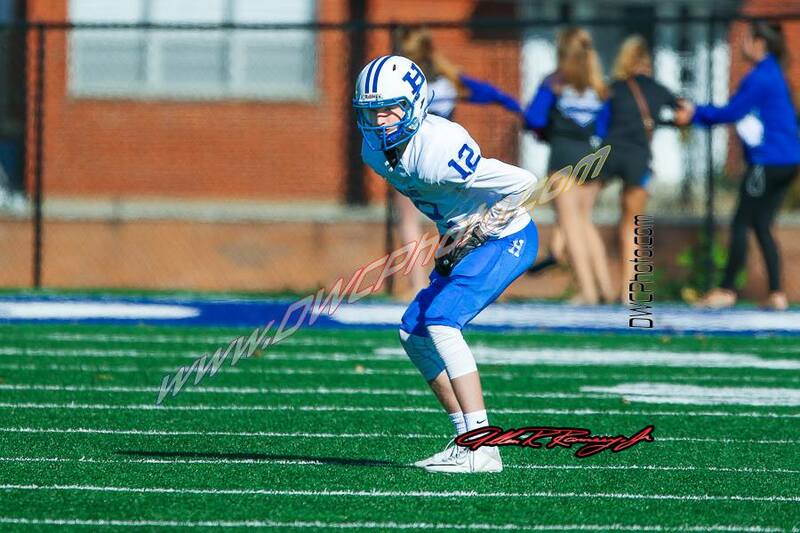 Highlands sophomore Kyle Turner waits to make his move on a kick-off on Saturday's junior varsity contest against Dixie Heights. Highlands won 58-0. 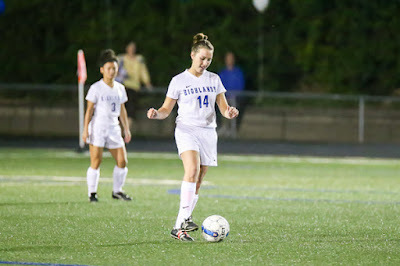 The Highlands Bluebirds soccer team wanted to put two halves together better in its final tune-up before the postseason. PHOTO: Allen Ramsey, DWCPhoto.com. The Highlands seniors pictured with their families are Parker Smith (22), Simon Frink (0), Collin Ginter (20), Tommy Steppe (2), Colton Dolezal (17), Ethan Mills (16), Paul Tully (1), Solomon Farris (10), Aaron Williams (14) and Brandon Zachary (11). 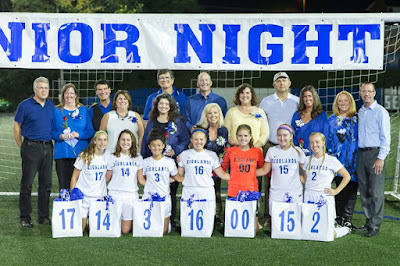 Like their female counterparts did the day before, the Highlands Bluebirds soccer team (14-2-2 overall) celebrated Senior Night with a shut-out. Highlands took out the Beechwood Tigers, 7-0 at Tower Park to move to 9-0-1 in 9th Region action. 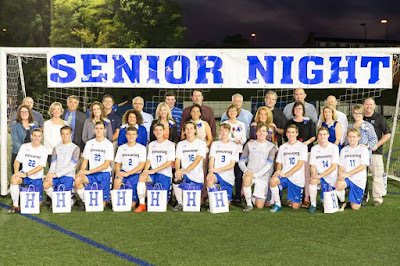 The 11 Bluebird seniors are Aaron Williams, Brandon Zachary, Collin Ginter, Colton Dolezal, Ethan Mills, Parker Smith, Paul Tully, Simon Frink, Solomon Farris, Tommy Browe and Tommy Steppe. Tully and Frink made two saves each as Highlands recorded its 12th shut-out of the season. Highlands outshot Beechwood, 25-3 bouncing back from a 3-0 loss to Cincinnati La Salle on Thursday. PHOTO: Allen Ramsey, DWCPhoto.com. Highlands senior Kayla Nehus (14) makes a pass while senior Karolyn Lukjan (3) watches. Nehus received a pass then passed it off before a substitute came in. Nehus has been out this season recovering from a torn left ACL. PHOTO: Allen Ramsey, DWCPhoto.com. The Highlands Ladybirds soccer team celebrated Senior Night with an 8-0 win over Bishop Brossart on Monday. Pictured with their families on the bottom row are Sydney Ossege (17), Kayla Nehus (14), Karolyn Lukjan (3), Claudia Hils (16), Shannon Eaton (00), Kiersten Clukey (15) and Annalee Brewer (2). The Highlands Ladybirds volleyball team took down the Boone County Lady Rebels, 3-1 (25-16, 15-25, 25-16, 25-23) at home. Submitted Photo. The Highlands Middle School Golf team claimed state runner-up honors in Louisville on Sunday. PHOTO: Allen Ramsey, DWCPhoto.com. 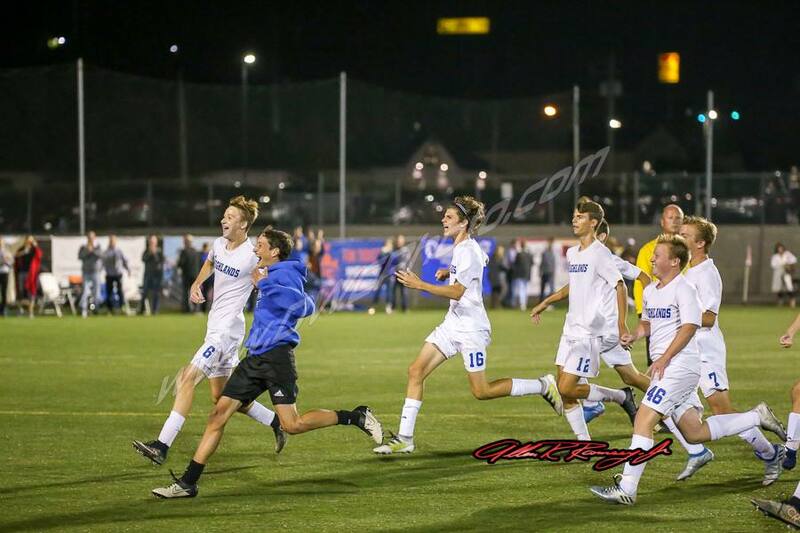 The Highlands junior varsity soccer team celebrates a 3-2 win over Covington Catholic, 3-2 on penalty kicks in the 9th Region junior varsity tournament championship. Head Coach Brian Wiefering saw the strategy in the junior varsity contest. The Cincinnati St. Ursula Bulldogs from Ohio's Girls Greater Catholic League put a lot of pressure up top. Their goal was to create short shot opportunities and disrupt the offensive flow of the Highlands Ladybirds at the minimum.